Do you have a Multi?? Warning: This post in intended to those who love/follow buses !! About a month back, I was at a travel agency waiting for my boarding pass. 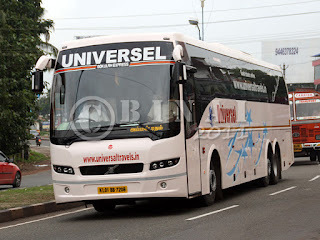 Of late, I've been a great fan of private operators on the Bangalore route - especially the multi-axle buses. Multi-Axle monsters have made road journeys even faster and comfortable - the speed certainly comes with its risks, but its indulging. Back to the story.. Just as the guy at the counter pulled out a stack of empty boarding passes, a guy walks in an asks for a ticket on a bus to Kerala. The agent pulls out a file and checks availability - he replied that ticket was available and said the rate was Rs. 560. Then comes the next question: "Multi alle?". (Isn't it a Multi). The agent pulls out another file and quotes the new ticket rate. That question keeps ringing in my mind - Isn't it a multi??. What is so special about a Multi that every one wants one for their travel? Kerala's biggest, and perhaps the only, Multi-System Operator, Asianet Cable (ACV) stopped airing signals of the ESPN-Star Sports bouquet (comprising of ESPN, Star Sports and Star Cricket) since over a month now. ACV argues that ESPN has raised subscription charges heavily and that they stopped airing the channels to protect consumer interests. ACV has maintained steady subscription charges for a long time, despite increased operational costs.ACV offers the maximum number of channels for a Cable TV network, and they offer very good service on their Digital system. The switching off of ESPN-Star signals comes at a wrong time for sports lovers - with plenty of sports action lined up for the next few months. It appears that ESPN-Star are desperate for business - they have started a campaign to reduce the subscriber base for ACV.